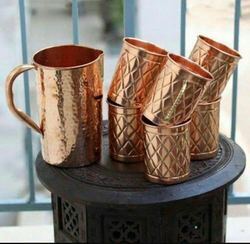 Fine Decorative Copper Painted Bottle Available In Different Designs & Sizes. - Hand Crafted Copper drinking bottles Make Excellent Gifts for Both Men and Women; Great for Weddings, Anniversary Gifts for Mom and Dad or Husband/Wife, or Simply as a Fun Novelty Addition to Your Current Bar Collection. 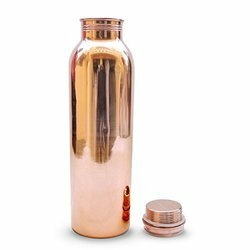 Divine Copper Handmade Hammer Pure Copper Water Bottle, 1000Ml. ... Yoga Water Bottle, Pure Copper Handmade, 1000Ml, Joint Free, Leak Proof, Travel…. ... Why get bottle made of plastic or glass when you can get a pure copper bottle for the same amount. Its Healthy Life for Men & Women. Tallboy Steel water bottles look sleek and slender, and are available in various shapes and designs. These bottles are ideal for storing water in the fridge and can be carried on-the-go to help stay hydrated. This is a bottle from the house of Tallboy, a brand which offers more than 1080 varieties of Steel products made in India, with the aim to reach common households throughout India.